We thoroughly enjoyed our time in Michigan, fishing the “Fab Five“. We also had a great time with family camping at Holland Beach and at Hartwick Pines State Campground. 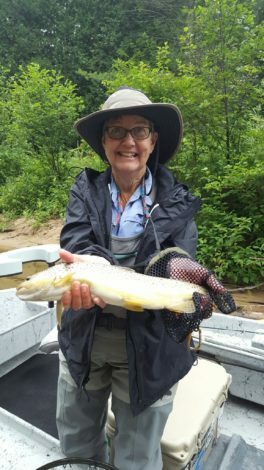 The “Trout Town” of Grayling was a treat from awesome fly shops like the Old Au Sable Fly Shop to great food at Spikes Keg O’Nails and Goodale Bakery. Fishing the 4 TU Top 100 streams, theAu Sable, Manistee, Little Manistee and Pere Marquette as well as the Pine was a real treat. We caught (and released of course) dozens of little brookies and a handful of really nice sized browns. While we missed the “hex hatch”, we fished dries and twitched/stripped streamers to lure the fish to our nets. Please enjoy this tribute to our time in “Pure Michigan”. We’re now rambling on to points West. Yes, I’m a college basketball junkie. I can still vividly remember the excitement around a group of 5 mercurial freshmen at the University of Michigan that set the collegiate basketball world on fire during the 1991-92 season. But this isn’t about basketball, but about the “Fab Five” trout streams we had the pleasure of fishing in Michigan. Four of the streams are a part of the TU Top 100 Trout Streams. The fifth, honestly fished better than any of the others even though its not on the “Top 100” list. 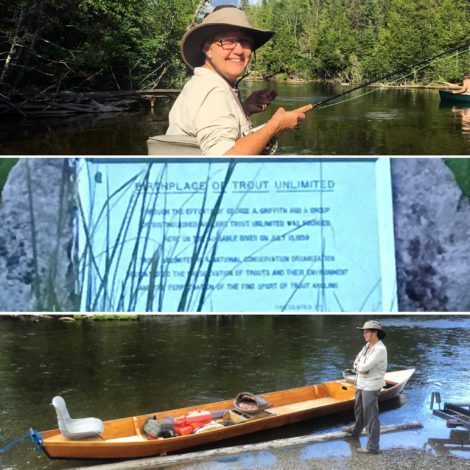 We started our Michigan tour in the Grayling area (stayed at Hartwick Pines State Park) which boasts two Top 100 Trout Streams, the Au Sable and the Manistee. 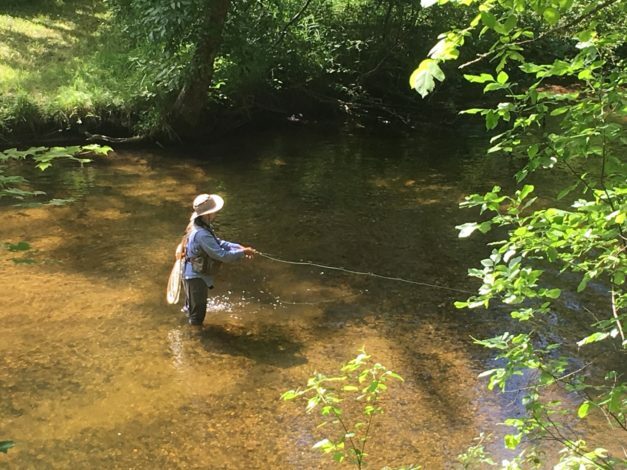 The prime season for the “hex” hatch had just ended but when we walked into the Old Au Sable Fly Shop in Grayling, Andy convinced us we HAD to go out that very night and try. Barb and I went out around 9:30pm to the Goose Creek Campground Access to the Manistee River, hiked in about 1/4 mile and found our spots. We both had nice cut banks with some structure around them where big fish might hide. We had our headlamps on our heads but off as we awaited a possible hatch. While it never came, I did catch a nice 14″ brown on a “hex” fly about 10pm. When 10:45 arrived, it was pitch black outside and Barb was ready to go. Naturally, at that very time, a huge fish (think 24″ or more) hit Barb’s fly in the dark. It surprised her so much it got away. Not much happened after that so we headed back to the car around 11:15pm. The next day, Chris Drake (son-in-law) and I floated the Manistee with Alex Lafkas in a genuine Au Sable River Boat. While the fishing that day wasn’t too great, we had a great time on the river (see gallery pic) catching a few small brook and brown trout. Unfortunately, a big thunderstorm blew up and we high-tailed it off the water. Next, it was Barb’s turn to be in the the Au Sable River Boat with Alex as we floated the Au Sable River. We put in at 2pm and fished until 10pm that evening. Since sunset wasn’t until then, we had a great time fishing with the sun off the water for half the time. What that meant was that we had brookies and browns rising regularly and we caught our share of them on dry flies. Lots of fun and an incredibly relaxing float. We also saw where Trout Unlimited was originally formed (see gallery collage pic). Barb and I waded the Au Sable on our own a couple more times while we were in the Grayling area. Wading both up and downstream and hitting the banks looking for big fish, we were happy with plenty of 10″ trout. Every so often, a special racing canoe would come barreling down the river past us. There is a big race every year on the Au Sable called the AuSable River Canoe Marathon and teams were already preparing for it. 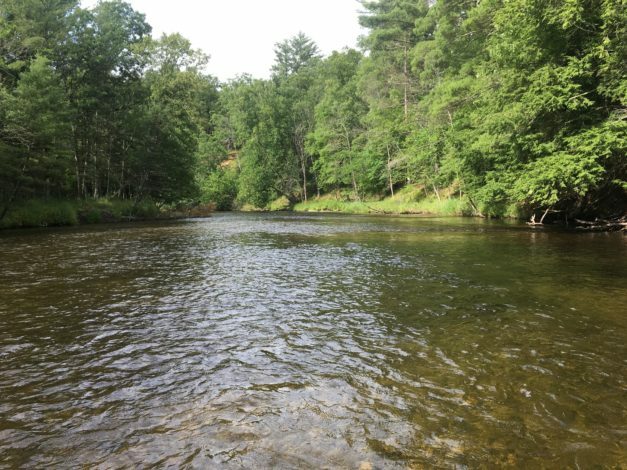 We next moved down to the Irons/Baldwin area to fish 2 Top 10 streams, the Pere Marquette and Little Manistee, as well as what was described to us as the “best” trout stream of them all, the Pine River. The Little M was just down from our campground in Irons. Barb and I found access points at the Irons Road bridge our first morning and stepped into a small stream fishing for brookies and the occasional brown. We found a few but had a wonderful morning searching them out in each pool (see gallery pic) as we walked downstream. 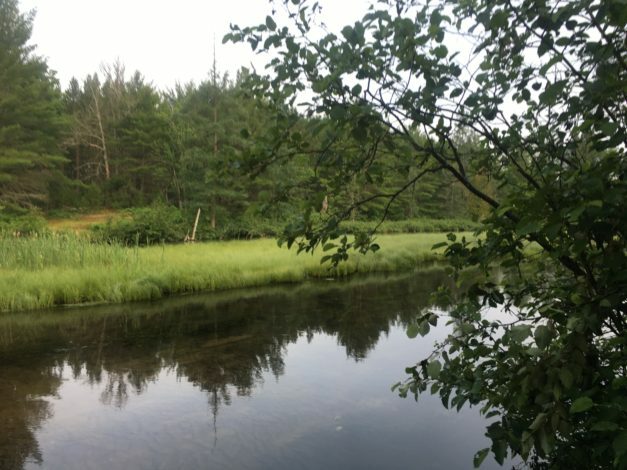 When we hit the DLoop fly shop in Wellston, we were told that the Pine River was the one we REALLY wanted to fish. Lucky for us, we got a slot to fish it. Guided fishing trips on the Pine are regulated heavily with only a few allowed each season. Turns out the Pine is much more a paddlers river and thus protected for them. We went out with Brad Turner, The PM Angler. Brad was as excited as we were in that he’d not paddled the Pine in some time as a guide. We had a blast on the trip (another 2pm – 10pm) and caught numerous fish and some really nice ones (see Barb’s catch in gallery above). The fly of the day was “The Skunk”, black streamer with white rubber legs that we twitched and stripped. Barb was especially deadly with this method. Finally, we fished the Pere Marquette River in somewhat the same way we’d fished the Au Sable. We waded it on our own a couple of days before floating it with Tommy Lynch, “The Fish Whisperer”. While the “bite” wasn’t on in a major way, we still hooked into a few good sized browns throwing hoppers and “The Skunk”. All in all, the Michigan “Fab Five” rivers where just that….. fabulous!